Black Friday and Cyber Monday are coming up – if you plan on shopping either or both of these days, here are some of my favourite tips for it. Black Friday is on November 25th this year and Cyber Monday will be on the 28th. Over the last few years things have really changed – black Friday was just in stores and cyber Monday online. Now it seems most stores are combining the two and really extending the sales, both online and instore. There are a lot of great possibilities for deals, whether you’re looking for new appliances, new clothes, toys, gifts or even a car. If you plan on heading out to specific stores, make sure to keep an eye out for what times they’ll be open on that day – and what kind of extra promotions they might have for the first customers. I’ll be updating on my Winnipeg Blog as we get closer with all of the times, so stay tuned for those. If you are heading out to shop and plan on picking up clothing for yourself or your family, know your sizes well. If it’s for people who aren’t with you, write their sizes down and for kids you can even just trace their feet. If you want to be quick in the stores, wear clothing that is easy to change in and out of – huge time saver, especially if you can just try things on in the store, without heading to a change room – sweaters, etc. Another thing to remember is that they might have specific cash only lines, or their machines might go down – being prepared with alternate payments can be a huge time saver. If you’re running items out to the car, or going store to store, make sure none of them are visible in your car. If you plan on shopping online for either promo there’s a lot you can do in advance too. If you plan on using a prepaid card, make sure to preregister it online more than 24 hours in advance. If you’re using giftcards, double check their balances. Also, if you plan on shopping several stores, make accounts in advance to save time, especially if you plan on going through a site like Ebates to earn some money back. Make sure to check for promo codes, discounts and shipping requirements – if you can combine several deals and find some good sales it makes for a great shopping day! If they do have a minimum amount to ship free and you don’t plan on spending that much, see if a friend or family member wants to combine orders. Another thing to remember whether you’re shopping online or in store is to check reviews, especially for things like small appliances or electronics. A quick search online could save you a lot later – a good deal on a bad item isn’t such a good deal after all. A lot of the online deals will be going live at all kinds of hours too – so keep an eye on those. A lot of sites have only a limited amount of the big deals too – which sell out quickly. What I usually do is put everything on our wish list into my amazon basket – if they go on sale I know right away and can shop accordingly. Great if you have a lot of gifts to pick up. Amazon’s minimum for free shipping is $35 now, so keep that in mind if you’re ordering smaller items. 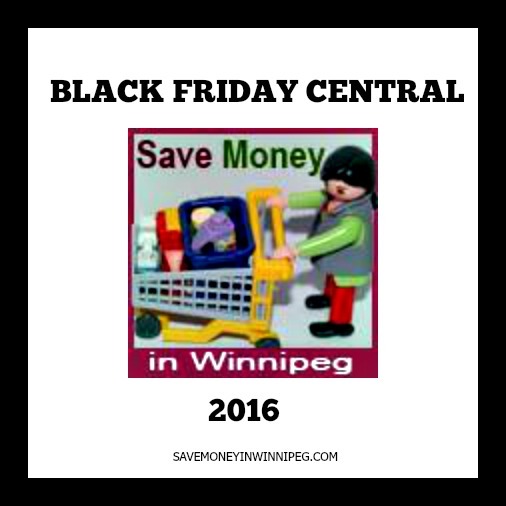 I’ll be updating as we go on my Winnipeg Blog with all of the sales, deals, promotions, codes etc. for stores across Canada. It’s a great time to shop, and love when local stores join in too! Do you plan on shopping either day? From home or online? Any big deals you’re waiting for? What are the best Black Friday Deals in Canada you’ve ever found? I’m hoping for a good sale at IKEA, has anyone heard what they might be offering?